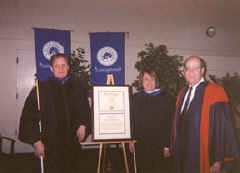 On April 15, 2002, Menlo College honored Joanne Wilson, Commissioner of the Rehabilitation Services Administration, U.S. Department of Education. During the morning the institution sponsored a disability rights seminar in honor of the occasion. Presenters were Fredric Schroeder, Past Commissioner of the Rehabilitation Services Administration; Marc Maurer, NFB President; Chris Jones, Vice President of Windows Clients for Microsoft; and Curtis Chong, NFB Director of Technology. The degree ceremony took place following a luncheon and program. Commissioner Wilson herself spoke at 1:00 p.m. on the topic of "Reaching Greater Heights." The ceremony awarding her the Doctor of Humane Letters then took place, followed by a reception. A number of Federation leaders from across the country attended the day's events.